The founding ethos of Longbox Graveyard is to examine the Bronze Age comics of my youth, and my feelings upon looking back at them thirty-odd years after the fact. But this blog project has reawakened an interest in comics as a whole, and even as I sort through my Accumulation, I’ve been casting a cautious eye toward a few more modern series. One book, in particular, is so well-crafted and been such a part of recent events in my life that it deserves a column all it’s own. A couple weeks ago I did a list of top Captain America graphic novels, and had to admit that the best take on my favorite character was — gasp! — a comic collection published in 2007. 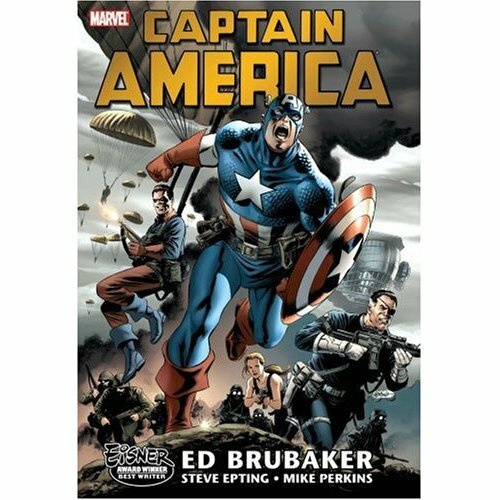 Captain America Omnibus Volume 1 collects the first twenty-five issues of Ed Brubaker’s run on Volume 5 of Captain America. That we’ve gotten to five volumes on this series is a kind of mute indictment of how much Marvel and this character have lost their way in recent years, as each one of those new volumes represents a “this time we’re getting it RIGHT!” reboot. But this time they did get it right. I backed into this book, having given up reading comics regularly decades before. 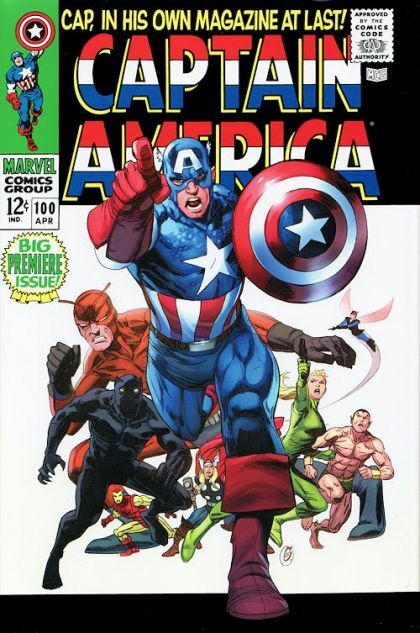 I checked in every now and then — I recall reading a couple issues of Ultimate Avengers, where Cap was a crusty, old-school badass, and I think I read some Mark Waid books doing an ill-advised mid-nineties reboot — but Cap was entirely off my radar when I discovered this big omnibus in 2007. It was out of character for me to buy it, full price, off the rack at a Virgin store in Arizona, but I was on vacation with my family, and enjoying a peak year thanks to the sale of High Moon Studios to Vivendi, so I tumbled. 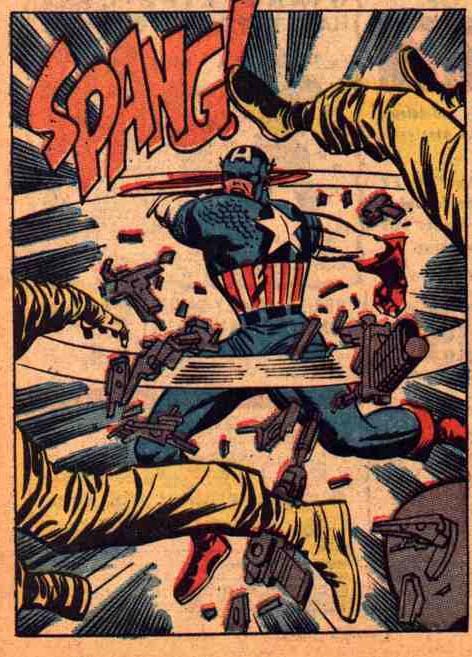 Plus as I noted in that column a couple weeks ago, I loved Cap even if I hated his comics. And the tremendous cover didn’t hurt. My expectations were low. I had a generally poor opinion of post-Bronze Age comics, especially comics I’d read in the 1990s, which struck me as “brand withdrawals” at the expense of the earnest if inconsistent brilliance of the original work from the 1960s. To me, modern books were all reboots, grim heroes, crappy costumes, and issue re-numbering gimmicks pandering to a dwindling audience of greying fanboys. This modern superhero book, though … it was a different breed. Far from being a brand withdrawal, it reinvigorated the seventy-year-old character of Captain America with what I’ve come to regard as the finest stories ever told about my favorite superhero. It also helped get me back into comics, though it would take years for me to realize it. I read the book, loved it, and wanted more, but discovered there were no additional collected volumes yet available, and my only option was to transition over to the regular comic book. That meant reading the story in monthly chunks (when the book could manage to stay on schedule), and being even more at the whim of Marvel’s marketing-driven editorial cross-over events, like the Civil War and House of M stories that intruded on the conclusion of the Omnibus. I’d have to trek to a comic shop to buy books in an inferior “floppy” form … and as much as I cherish Southern California Comics, I’m not interested in visiting there more than two or three times a year. I loved this new take on Cap from Brubaker and Steve Epting, but I had zero desire to become a monthly comic reader again, and so set this volume on the shelf and promptly forgot about it. Flash forward to the summer of 2011, and my son Jack’s innocent question about whether I had any Thor comics for him to read (and my own realization that I couldn’t find those books for him) has given birth to this blog. Originally intended just to keep me on track while sorting my old books, Longbox Graveyard was beginning to take on a little life of its own. It was Chris Ulm — ever my editor — who said I should do a column on Cap graphic novels to tie in with release of the movie, and that sounded like a good idea, both to get me back in touch with my favorite comics character, and as a means of getting new readers for the blog. I re-read about half of the Brubaker Omnibus, to confirm that it was as good as I remembered and deserved to be #1 on my list (and it was), but then got distracted by a more recent arrival on my shelf. As I’ve written before, Cap’s best years were over well before I started collecting his book in 1974, and the events of Cap’s run in Tales of Suspense — with it’s Cosmic Cube, Sleepers, A.I.M., and the Red Skull — formed the rich and mysterious back-story to the inferior era of the books I had actually read. This new Captain America Omnibus Vol. 1 HC collected all the Silver Age stuff that I’d missed, and with this blog project making me all nostalgic for the good old days, this seemed a good time to go back to the era where men wore hats, Steve Rogers smoked a pipe, and Jack Kirby never drew Cap with his feet less than four feet apart from each other. I read those issues the way I read pulp fiction like John Carter of Mars, Doc Savage, or the Shadow — for the concepts, the characters, and the ideas — but with diminished expectations for execution, plot, and dialogue. Cap’s Silver Age run still has a lot to offer. 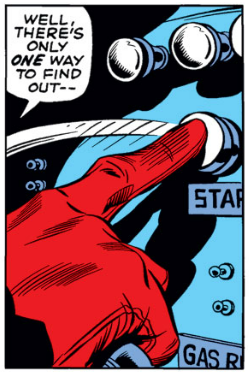 There’s Kirby, of course, who delivers the goods from month to month, and Stan Lee’s scripting is decent (if overwrought), but the series is second rate, really a collection of crazy ideas that fall apart under close inspection. I mean, the Sleepers are … well, a headless robot that stomps around, that joins up with a flying wing, that is completed by a big flying steel skull, that all connects together to fly to the North Pole to destroy the world. But the concept of Nazi terror weapons lying dormant in the earth until “Der Tag” is awesome, as are so many other elements in this run, and I heartily recommend it to comics fans that know what they’re getting into. I came away from it with my head dizzy from all the crazy details and events, glad to have read it, gladder still to have enjoyed the art, and feeling that I’d filled in holes in my goofy comic book knowledge. I was especially thankful that I didn’t have to hold all those details in my head or try to address them in a modern series. Then I realized that’s exactly what Ed Brubaker had done. Something I will look at in this blog, time and again, is reinvention of characters and core concepts. 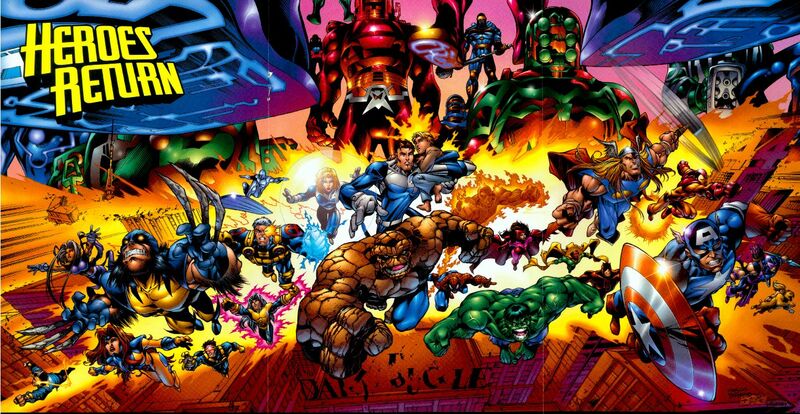 Comics are possibly unique in that the characters and books continue, while creative teams come and go, and the ideas of the books get worn out and need to be periodically reinvented to remain fresh. 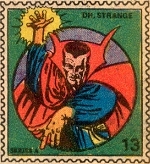 Some of my favorite creators — Alan Moore and Jim Starlin, for example — made a specialty out of this kind of reinvention. While I think there’s something admirable about a solid run on a book that doesn’t turn everything inside out in the process (like Doug Moench’s run on Batman and Detective in the 1980s, which I will get around to reviewing someday), there’s no doubt that when it works, a comic book reinvention is about the most spectacular and exciting thing that can happen in this form. (And when it doesn’t work, you have Heroes Reborn). In my shorthand appraisal of comics reinvention, I’ve got Alan Moore on one side, who reinvented characters by probing deep into their psyches and revealing things we never new about them … and along the way, as I once read it summarized, made it seem like every book he wrote was the last comic book ever written. Moore took no prisoners and left no room for any creator to follow him. Really, who wanted to read Swamp Thing after Moore was done with that series? With Brubaker’s work on Cap, I see a third means of character reinvention. It might be the most difficult means of all — reinvention by embracing the past. The really wonderful thing about Brubaker’s work, and the reason it is such a high wire act in a wind storm, is that he doesn’t run from anything in Cap’s past. All that Tales of Suspense stuff is in this series — Agent 13, Bucky, Red Skull, the Cosmic Cube, the Sleepers, Cap in the war — and Brubaker makes it all work. 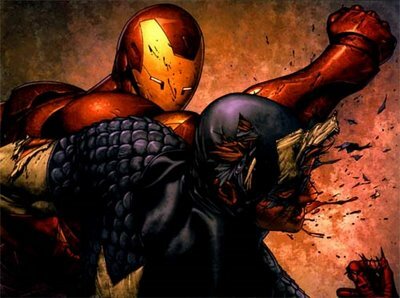 Civil War … Lord save me from editorial cross-overs! Like Walt Simonson’s run on Thor, Brubaker embraces the best part of what works about a classic character, then makes the rest his own. 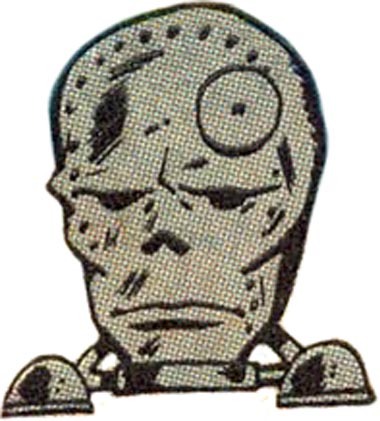 He’s so convincing as a writer that you just nod and go, well, sure, of COURSE it was the Red Skull’s plan all along to use the Cosmic Cube to cause his own death but to also take over the soul of a Russian industrialist so that he can manipulate Cap’s old girlfriend into killing him by poisoning her mind through the cat’s paw of Dr. Faustus (Dr. Faustus?!?). It’s as ridiculous as anything out of Tales of Suspense, but Brubaker makes it feel plausible, modern, and completely, authentically “Cap” because of the way he has deeply embraces the past of the character without being enslaved by the ridiculous minutia and continuity of the older books. Finally, an even more personal connection between me and this work. My oldest son, Miles — who hates to read and wouldn’t pull his head out of Grand Theft Auto if the house was burning down — has gotten hooked on this series. So thanks to the efforts of Mr. Brubaker, Mr. Epting, and the other artists on this run, I can talk with Miles about Captain America and the Red Skull and Bucky, and the comics I read as a kid. We’ve connected as father and son because these ageless archetypes, so frequently abused by past creators, have been brought brilliantly to life by a creative team that just gets it. Completing my re-read of Brubaker’s first volume with such enthusiasm, I now need to decide if I will push my luck and read the additional collections that are now available, covering (I gather) the death and rebirth of Captain America. They’re on my shelf, still in their shrinkwrap. I don’t want to see a great series go into decline, but seeing as I’ve waited all this time for Cap to get good — waited, in effect, since I bought my first Captain America comic in 1974 — I guess I’ll be tearing the shrinkwrap off those volumes sometime soon. Given enough time, even a cranky guy like me eventually comes around. 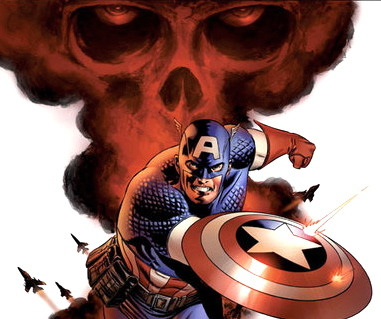 Posted on August 3, 2011, in Reviews and tagged Captain America, Ed Brubaker, Jack Kirby, Marvel Comics, Red Skull, Stan Lee, Steve Epting. Bookmark the permalink. 31 Comments. Wow, what a great read! Brubaker is the reason I read comics. Criminal got me hooked and I had to read more of his work. So I found Captain America. And I’ve read everything he’s written since. Paul, reading how Brubaker and Epting has connected you and Miles was pretty powerful. Thanks for sharing. Brubaker’s pretty damn good, isn’t he? I’m jealous. The connecting with Miles bit is a critical breakthrough for me. Miles is a smart, smart kid but reading does not come easily to him, and he seeks extreme stimulation, which means he slides down the path of least resistance to video games. I’ve worked in video games for decades, and I introduced this particular serpent into the garden, so I am not going to rail against the evils of the form, but it does him no favors to spend his days plugged into Gears of War and Grand Theft Auto for hour after hour. The only way reading gets easier is to READ, and Miles is game for it. He’s read some Stephen King, and he liked Fight Club. He reads a few comics — Walking Dead, Sin City … basically I’ll try anything in his hands if it will hook him up and get those words moving through his brain. I still have to make him turn off the games and come into the bedroom and read with me, but that’s progress. That he’s enjoying this Cap anthology is a break-through for us because I have such a sentimental attachment to the character, and these are genuinely good stories. It gives us one more thing in common and makes me enjoy this run that much more. Hats off to Epting for rendering the story in a way that made it look believable, too. 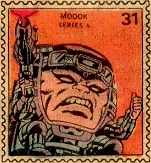 By stripping the Kirby exaggeration off and going for a more realist look, those recycled Bronze Age gags seem… serious! Issues 26-50 are solid, too. Once Epting leaves the title and Cap comes back, not so interesting. Incognito’s fun but cynical, expecially if you ever had an office job. I took the reverse path Farrell did, discovering Brubaker’s Cap when a friend bought me some Brubaker issues, then seeing what else he was up to. A++ on Criminal with Sean Phillips. If Miles still needs some Thor, I ended up with duplicates of 337-374. The power of those Kirby creations is they can been compressed and reduced in scale and still hold the power of their primal forms. I have a running argument with my business partner Chris Ulm over the viability of Kirby’s Fourth World stuff as a film property. I think the core of the Darkseid/Orion/Scott Free conflict could make a strong film story but the Ulm thinks it is just too far out there for the audience to buy off on an exiled war god who masquerades as an escape artist. In skillful hands, though (such as Brubaker and Epting), it’s proven that Kirby’s wilder flights can be reigned in and mined for a new generation and in new forms. Problem is that DC can’t seem to make a decent movie unless Christopher Nolan is at the helm. I suppose they should set their sights on getting Superman right before trying to bite off Big Barda or Para-Demons. Thanks again for posting, Mars (as always). I’ve been greatly enjoying the Kirby stuff you’re posting over at your blog (http://marswillsendnomore.wordpress.com/). Keep it coming! Have you read the Winter Soldier stuff? 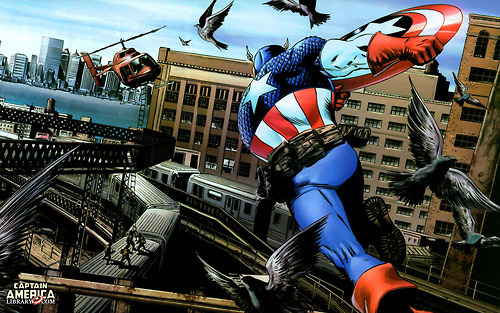 Wondering what your thoughts were on it as a comics story, and as a possible (at least in name) inspriation for the Cap 2 movie. Just venturing into 2007 from my Fortress of Oblivion here in 1978 was enough to give me a nose bleed, and I haven’t read much beyond the volume on review here. I did read the “Death of Captain America” Omnibus that followed and I think I have one more on the shelf. I know that Brubaker’s Winter Soldier story continued through a book of its own right up until these last couple months, and I figure to get to them eventually. (I’ll check out your review, too). I will admit to a little yelp of fannish glee when Winter Soldier was announced as the subtitle to the next Cap picture (a reaction shared by Mr. Brubaker himself). Even just the first issues of Winter Soldier are a complex story and it will be curious to see how much of it makes it onto the screen. The Marvel movies have already shown they can handle espionage stories thanks to Fury and Black Widow so I will assume we are in good hands and look forward to whatever they have in store. Not surprisingly another thoughtful Longbox introspection. The appreciation of comics form bursts out here, something all us fans can relate to when we find that convergence of a beloved character and terrific modern story. I dig on nostalgia too, and it’s great to find new stuff that inspires the same wonder. That bit about embracing characters’ past is so true. Awesome to read about your son too. Not just your connection but that he discovered the wonderful world of comics. Hey, Doug, great to hear from you! Thanks for reading and posting. 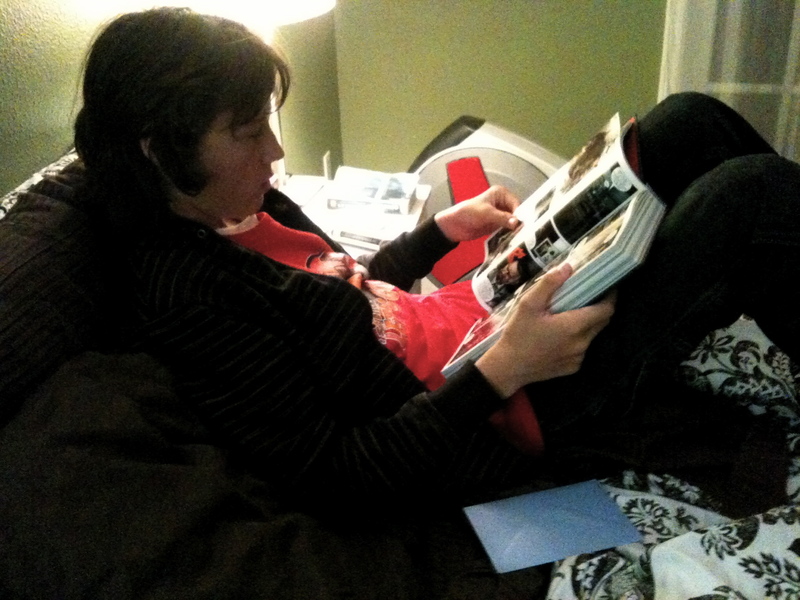 Alas, but Miles’ interest in comics didn’t long survive the taking of that photo! He will read the occasional Walking Dead, but I think he’s a lost cause. I do have a stack of Swamp Things on the nightstand of my H.P. Lovecraft-loving younger son, Jack, though … hope springs eternal! Curious on your take on Bendis/Brubakers Daredevil, guess I’ll keep checking back! I sure as heck better get a good Google rank for Buscema/Belit/Conan … that was practically my religion here at LBG in the blog’s first year! I haven’t written much about Conan lately, but these things run in cycles. I kinda-sorta wrote about the Bendis/Maleev run on Daredevil here, but it was more a general assessment/critique of Bendis’ style than a look at that specific run. In the three years since I wrote that piece, I have come to better appreciate Bendis, to the point where I found myself recommending that run to a friend just last week … with the caveat that he read it as part of his all-you-can-eat Marvel digital sub, rather than paying for a collection or by the issue. I think Bendis is a superior long read with a spooled-up stack of stories so you can get all of the tale in one go. I honestly don’t know how anyone can read him in month-to-month serial format. (I thought Bendis’ books were the most consistently good of the latest Marvel relaunch, too). So I guess I am a fan, but I stick by my position that Bendis’ books would be that much more effective if they better leveraged the visual advantages of comics. As far as the Brubaker phase on Daredevil, I recall liking his run after Bendis left — the one where Matt Murdock’s secret identity has been compromised, and he winds up in prison. The real standout for me in that run was the way Bendis handled the Punisher (my favorite take on that character by far). I like Criminal and Fatale just fine, but I miss Brubaker on Marvel books. He had a particular genius for reinvention, and I am more entertained when he applies those talents to Marvel/DC superheroes than crime noir. That reminds me that I’ve been meaning to review Brubaker’s Catwoman run for DC for an age … maybe next year.